garvald church, originally uploaded by gilfling. Hello April! Oh the weather here this last week has just been gorgeous, so summer like and warm. I had an unexpected trip to Scotland this last week and a bit after my mum was in hospital receiving surgery (she got one days notice so it was very last minute) but it was fine timing as my visit served another unexpected but much needed purpose. So yep whilst my family were getting ready to kidnap me in chains in order to get me to view places and get something booked, this trip enabled me to do just that without the threat of torture. So here we have it, up above....the church is booked and I couldn't be happier. Although our minister has been booked for a wee while we still needed to decide on a venue for the wedding and reception and it is even more delightful and picturesque than my photos indicate. 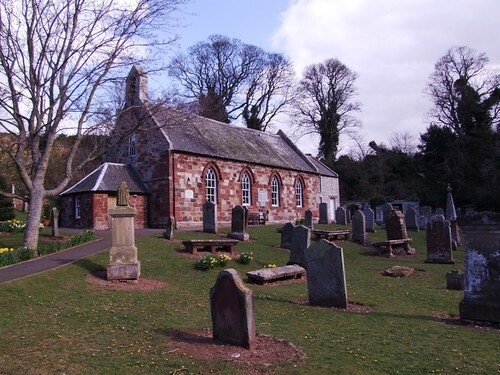 Tiny and quaint and in a wonderful village in the heart of East Lothian, Scotland (my 'home' and where I was brought up).Now that we have the venues booked I am actually getting quite excited rather that just feeling an overwhelming terror and a desire to just elope. You can view more photos of the church and the hall for reception here if you so wish! Hello lovely, sorry I haven't stopped by your blog in a while! My wedding is just before yours from the sounds of it, it is just under 6 months away now. Wherever venue & theme is, weddings are marvelous.